The open source nature of Linux has always intrigued embedded engineers, and the latest kernel releases have provided new features enabling more robust functionality for embedded applications. Enhanced real-time performance, easier porting to new architectures, support for microcontrollers and an improved I/O system give embedded engineers even more reasons to love Linux! However, the rapid evolution of the Linux world can result in an eternal search for new information sources that will help embedded programmers to keep up! 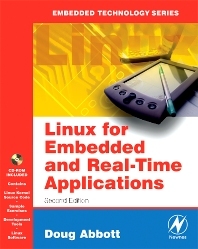 This completely updated second edition of noted author Doug Abbott’s respected introduction to embedded Linux brings readers up-to-speed on all the latest developments. This practical, hands-on guide covers the many issues of special concern to Linux users in the embedded space, taking into account their specific needs and constraints. The accompanying CD-ROM contains all the source code from the book’s examples, helpful software and other resources to help you get up to speed quickly. This is still the reference you’ll reach for again and again! 100+ pages of new material adds depth and breadth to the 2003 embedded bestseller. Covers new Linux kernel 2.6 and the recent major OS release, Fedora. Gives the engineer a guide to working with popular and cost-efficient open-source code.